The Natural Sleep Store is proud to carry The Bedworks of Maine’s solid wood furniture. With a wide selection of bed frames, dressers and tables this furniture can be finished with a wide range of formaldehyde free finishes and can even be ordered unfinished. 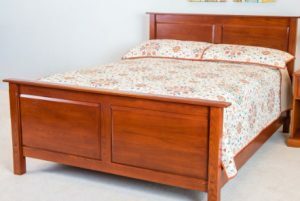 We offer the Zen Bed, Sedgwick Bed, Franklin Bed, and Yarmouth Bed through our website site, however, we are happy to sell the Bedworks of Maine full line of solid wood furniture. Please contact us to order. Free Shipping on Bed Frames! The Yarmouth bed is a platform bed made of solid North American ash. It has a beautiful grain and is hand sanded and finished. The slats are made of solid hardwood. Metal on metal corner connection frame assembly. $419.00 – $714.00 Platform bed made with solid North American ash. One of our top sellers! The clean lines of this classic, beautiful bed frame add style to any bedroom. 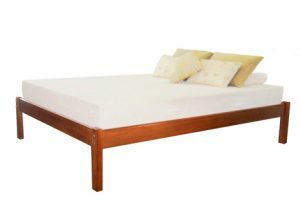 The Sedgwick bed is a platform-style bed with slats that can support the weight of an organic latex mattress. It is made of solid North American ash. It has a beautiful grain and is hand sanded and finished. The slats are made of solid hardwood, and it has metal-on-metal corner connection frame assembly. $609.00 – $1,029.00 Classic platform bed made with solid North American Ash. Choose from a variety of finishes. The Franklin bed frame by Bedworks of Maine is crafted using solid North American Ash. 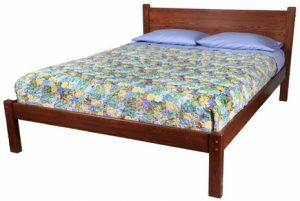 It features a beautiful raised panel headboard with matching footboard. With its sturdy construction and classic lines, the Franklin bed is timeless. $1,099.00 – $1,309.00 Crafted from solid North American Ash. Choose from a variety of finishes. The Portland bed frame by Bedworks of Maine is crafted using solid North American Ash. It features an elegant bookcase headboard, metal on metal corner construction, and hardwood slats. $949.00 – $1,309.00 The Portland features a bookcase headboard and solid North American Ash construction. Choose from a variety of finishes. Since 1975 The Bedworks of Maine has been manufacturing solid wood furniture from locally sourced hardwoods. The Bedworks of Maine’s craftspeople are proud of the work they do and it shows. A fine domestic hardwood, ash, is used in the furniture and bed frames. The Bedworks of Maine Ash is renewable, sustainable and bio-degradable. The glue used is made from milk. The finishes are of the highest standard and contain no urea formaldehydes and have all passed ASTM testing for lead. Now, a water-based low VOC clear coat can be used as the final finish. 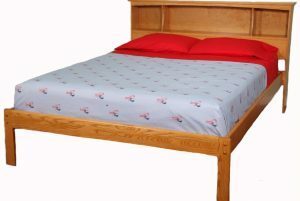 All the beds are very nice quality and are all made in the USA. Their cabinetry features dovetail corner construction on all drawers. Always committed to sustainability, The Bedworks of Maine packaging is made from recycled materials wherever possible.